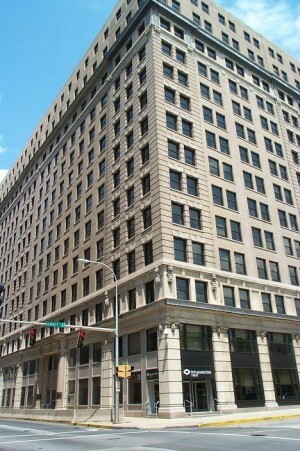 The DuPont Building, occupying the entire block bound by 10th, 11th, Orange and Market streets, was one of the first high-rises in Wilmington, Delaware. It looks out over Rodney Square. The building was built in phases, with the original building constructed in 1908 fronting Rodney Square. At the time, the building housed the offices of DuPont. 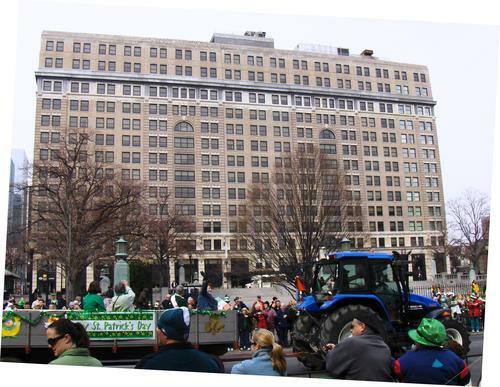 In 1913 the building was expanded into a "U" by adding wings along 10th and 11th streets, the DuPont Playhouse was added, and a portion of the original 1908 section was converted into the Hotel duPont. The final addition to the building occurred in 1923 when the Orange Street addition was added along with an additional two floors (bringing the floor count to 13 and the height to 124'). Currently, the building still houses DuPont's headquarters, the DuPont Theatre (formerly the Playhouse), the Hotel duPont, a Wilmington Trust Company bank branch, and a number of small shops and offices in the interior of the ground floor of the building.